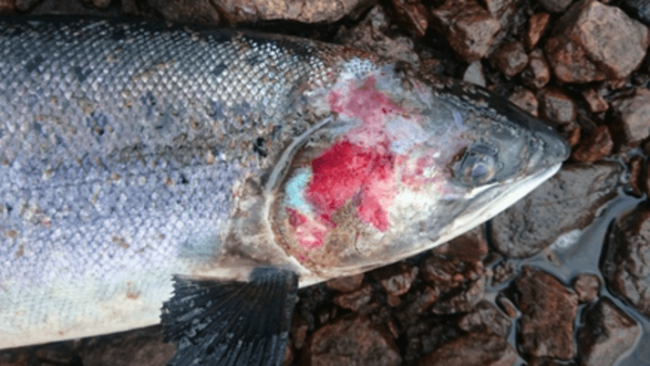 A wild salmon dead after becoming infested with sea lice from farmed salmon cages. Having just watched the appalling but sanitised exposé of mass mortalities of farmed salmon on a Scottish fish farm featured on the One Show yesterday, I noted that despite the programmes coverage of these disturbing circumstances, the BBC presenters quickly skimmed over animal welfare issues and the impacts that these fish farms have on Scottish wild salmon. Tens of thousands, nay, hundreds of thousanads of fish dead and left to rot in a pit in the Hebredies and the only real summary the BBC glam presenters could provide was that things have improved in the last 3 weeks…..BBC, you are a disgrace and have lost credibility as serious journalists. You should have been in for the jugular on such appalling and unacceptable practices. What made it worse was that their first celebrity guest was none other than Joanna Lumley, an outspoken activist for human rights and a supporter of animal welfare groups, such as Compassion in World Farming amd Vegetarians’ International Voice for Animals… (Read her bio on Wikipedia for confirmation). She was silent on this issue….a true activist would have been outraged and unable to hold their tongue. Joanna, where was your compassion? Where was your passion for your cause? Outspoken activist? Huh, silent collaborator…one that enjoys her smoked salmon sandwiches I expect. I’m afraid Joanna, your silence on this issue was inexcusable and you can’t be taken seriously by any welfare organisations again…you were there to promote your new …. whatever it was and you failed to stand up for the very things that you publicly claim to support. Your self promoting slot was a sell out to your causes. Shame on you. The second celebrity guest was Ian Hislop of Private Eye notoriety. Have I got news for you, Ian Hislop, this fish farming industry is a public scandal waiting to be investigated by the likes of Private Eye and journalists willing to reveal the extent of the cover up, unlike those at the BBC. There’s a story here for Private Eye’s ‘In the back section’ (better known as ‘cover ups’). Finally, Matt Baker is a Countryfile presenter in addition to being the One Show’s sidekick to Alex Jones. It’s time Countryfile took a stance on this industry; an honest and firm stance against poor farming practices and terrible animal welfare credentials. Countryfile sanitises farming and country matters for urban viewers who may otherwise find such things as farm deaths, distasteful. Farm deaths on this scale should be unpalatable to all so show it for what it is! Consumers in this country take note. It’s time to stop buying farmed Scottish salmon. This industry claims to have improved over the last 5 years and are now operating to the highest standards….If hundreds of thousands of dead fish are an indication of their high standards, it’s time to take these poor vacuum packed, sea lice infested creatures from supermarket shelves and call time on this cesspit called aquaculture. You may not find a louse in your carefully screened and packed salmon fillets but you might find them distasteful after watching the video shown on the One Show’s feature. Enough is enough. The Fish Health Inspectors, SEPA and Scottish Government have to act to prevent this industry killing all the wild salmon returning to Scotland’s west coast rivers. In the last 30 years, stocks of wild salmon have disappeared faster than the lorries taking rotting fish from Scotland salmon farms. The two are connected despite what Government and the Industry would have you think.